Since the first and second piece about bringing back apartheid, I’ve had a lot of (white) twitter commenters say I don’t lay enough of the blame for where we are at the ANC’s feet. To rectify this, I’ll zoom in on the complicated romance between the ANC and white supremacy. When we look at the ruling party, we get this impression that there exists a tension between its “good” guys and its “bad” guys. Pravin Gordhan is the face of the ANC’s good side, and Jacob Zuma of its bad side. But Pravin Gordhan and Jacob Zuma admit that they aren’t fighting against each other so we can know upfront that this impression is wrong. Carol Paton’s BDLive article points out that depite Gordhan’s assurances that South Africa intends to practice sound governance, “State-owned enterprises continue to charge recklessly ahead, engaging in transactions and making deals with no regard for the Treasury or the laws that govern them.” She’s most likely referring to the latest SAA scandal in which its board was allegedly going to benefit from a R256-million-rand fraud conspiracy. The Sunday Times brought the story to public attention and Organisation Undoing Tax Abuse exposed that their appointed “transaction facilitator”, BnP Capital, wasn’t licensed to carry out their hastily-contrived fund-sourcing exercise, all within the space of days if not hours. BnP Capital was meant to help find part or all of R14 billion rand to help cover SAA’s debts before 1 July, without which the airline would have to crash-land and close. We’ve halfway through July and dololo Jesus crash-landing on earth to end SAA. Assuming the airline couldn’t use its internal staff to raise the money needed to pay off debts and expenses, they could have still gotten Nedbank or Deloitte, for example, to do it for a comparably smaller rate. Either Zuma and Gordhan are lying to each other or Zuma and Gordhan are lying to the rest of us. In a trend consistent with the ANC’s neglect to fight for South Africans since 1994, the evidence better fits the latter hypothesis that Zuma and Gordhan are lying to us. 1.) Was there going to be redress without white people/business losing something in the process? 2.) Was there ever going to be a non-corrupt reason the ANC would refrain from changing the status quo? The beneficiaries of apartheid, local and multi-national, were never forced to make reparations. The ANC did refrain from changing the status quo. It therefore follows that the ANC was bribed corrupt from Day 1. This taints everyone in it who did not exit immediately on principle. It also follows that the “good guys” serve to buy patience. 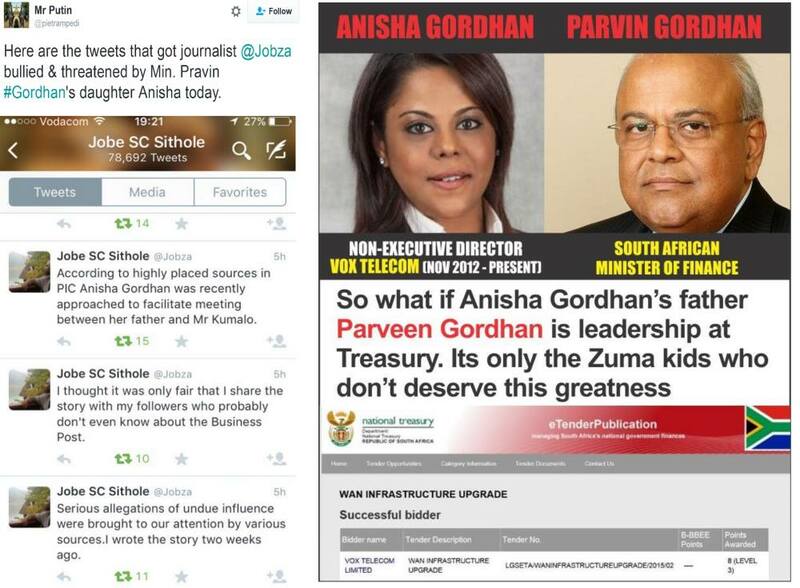 I’ve added a screenshot of a tweet insinuating that though Pravin Gordhan’s daughter, Anisha Gordhan, is also leadership at National Treasury, everyone only attacks Zuma for connecting his relatives to wealth and power. If this is true, then the memo on the ANC’s “good cop bad cop” strategy didn’t filter down to all of Zuma’s supporters; they blew the cover on Gordhan’s own questionable gains in order to support Zuma, not knowing they were exposing that Zuma’s willingness to be the “bad guy” to Pravin’s “good guy” is the plan. All along we’ve been told we should “protect” treasury staff from dishonest character assassinations. The Finance Minister has actually broken down in tears. Yet the bottom-line evidence at our state-owned enterprises indicates we’re being played by brilliant actors. That few of the threats made against any of them have materialised corroborates that they weren’t real. It’s tempting to believe the corrupt ANC people hate their good guys or vice-versa. Except for a few murders at local government level, this isn’t true at the top. Like your “good” and “bad” gut bacteria, the two sides need each other. Every black ANC-supportive community has default big-voiced leaders. They don’t necessarily have titles. Their job is to promote the ANC and repeat its promises, for which they’re rewarded by the “bad” guys at the top. They put them at the front of lines for tenders and other government work charged at inflated prices. If the “bad” guys didn’t nurture these relationships, the “good” guys wouldn’t have jobs either because there wouldn’t be enough votes on the ground. I suspect 90% of ANC supporters who contact me to stop prodding expect something from the party – a position, business deals, cash – otherwise they wouldn’t defend it. What happens when it turns out too many of them have had the same sweet nothings whispered into their ears for the Congress to satisfy? Richard Poplak’s Daily Maverick analyses on Tshwane uprisings indicate the bubble is about to pop. While the scheme satisfies enough people to work, the “bad” guys’ symbiosis with the relevant black people on the ground keeps enough black people patient with the ANC that even the “good guys” keep their jobs. This is necessary because when the party was bribed to maintain the status quo as it took political power from white minority rule in 1994, a post-liberation economic vacuum was created. Simply put, the NP ensured that if whiteness couldn’t exploit black people, the incoming government would never have the controls to move money and land to black people the way the apartheid government ensured it got into white hands. By ensuring that relevant black people get government business (or even if it’s just a government job), the ANC’s “bad guys” fulfil the terribly important role of keeping black voters complacent enough with the status quo the country signed on to when it “forgave” whiteness. Zuma’s existence therefore maintains both white supremacy and a huge ecosystem of corruption. When Dudu Myeni said she was fighting “racism” at SAA, we must conclude from the historical definition of racism (the systemic oppression and impoverishment of black people) that her particular form of “transformation” was ensuring her black “third party” supplier would get a cut of the loot. Again: the ANC maintains white supremacy and the corruption many black people turn to for relief from the economic exclusion that comes with white supremacy’s maintenance. The ANC giveth life and the ANC taketh life away. In the end, white supremacy will prove an evil more “sustainable” and stable than nepotism, so we could stop here and say when the gravy train dries up and the music ends, we’re back to apartheid anyway. In this, private-sector BEE is trickle-down economics meeting affirmative action’s tokenism, where a select few get rich for maintaining the 1994 sell-out. How else do we explain a certain unionist turning into a multi-billionaire? Who runs this whole scheme through the ANC? Up until recently it’s been the Guptas. The reason, for example, that Lindi Nkosi-Thomas could commit fraud on the same SAA Board, admit it and not be indicted by the Public Protector/SAPS/NPA, or that Dudu Myeni can scheme to siphon off millions and not get fired, is they’re all at the same trough owned by the same feeders. Now and then they come forward to give this “good guys” and “bad guys” performance, but it serves to keep the game they all need going. They know they need it because this is the only game that could keep the black vote post the 1994 sellout. Gordhan’s role is to buy time for Zuma’s girlfriend to loot for him before she steps down in August. And if she doesn’t get the score she wants, what with OUTA and Co. at her heels, she’ll be back on the board another term. When she gives the signal, Zuma will give the nod and Pravin will “fire” her or Zuma will Judas Iscariot Gordhan by firing Myeni ahead of Gordhan doing so, say “See how slow and indecisive these lesser-qualified finance ministers you guys force on me are? You should have let me keep Van Rooyen” and take credit for being a “listening” president. The DA’s job used to be ensuring the ANC “behaved” enough to maintain the status quo and keep things “business as usual” for whiteness’s sake. This worked in Mbeki’s time. That mechanism collapsed for internal and external reasons. Internal: the corruption injected into the ANC by the party’s love-affair with white monopoly capital exceeded the ANC’s political will to keep things business-as-usual. The crumbs falling off of white monopoly capital’s table wouldn’t be sufficient to keep up with this burgeoning demand or, for that matter, the second and external force: the black people who were not benefitting under Mbeki’s Thatcherist reign and wanted their slice of the pie. Indian money proved more sympathetic to this need because it very well understood how white supremacy had kept black people out of the economy while maintaining the myth of the moral whiteness of being white. As the “distant” Mbeki was replaced with the “warm” Zuma, the Oppenheimers, Rothschilds, and other white pockets played a lesser role in ANC member’s enrichment to be replaced by the Vivian Reddys, Shabir Shaiks, and then ultimately, the Guptas, all of whom were happy to let bigger bread crumbs fall down to black people behind whiteness’s back. In response, I’m guessing that behind the scenes white monopoly capital strengthened its alignment with the DA as opposition, which then took up its volume against ANC “corruption” with media (owned by who? Exactly) following suit. The fight against “corruption” is only over who gets to play with our state resources – England or India; Europe (the so-called “free” markets) or Asia (so-called communism, if you also look at Zuma’s love affair with the Chinese). Zuma made the game work with the Chinese and the Indian; Mbeki made it work with the English. Whoever owns the media and the rulebook gets to broadcast “the other’s” corruption. Relative to a Freedom Charter rooted in history, our current rulebook (the Constitution) is whitist. Saluting the Constitution, the DA’s brief anti-racism pledge stops short of referencing ongoing systemic racism as a product of whiteness. Two years ago, the party ran a #KnowYourDA campaign where it clarified its roots in the anti-apartheid struggle in response to perceptions that it was the DA that had run the apartheid state. This seems absurd unless you’re someone who suspects the DA maintains the myth of the moral whiteness of being white. That, too, is apartheid with the ugly scrubbed off, for economically it requires less redress and more “investment” from and to the whiteness that benefitted off this country under apartheid. My suggestion that we go back to apartheid in no way contradicts what the ANC decided about the nation starting 23 years ago. The explanation as to how whiteness fits into or benefits from this complex puzzle is only needed by white people who’ve never had white supremacy happen to them. Where many think the ANC is the primary explanation for its own corruption, it was white supremacy that chronologically and otherwise came before ANC corruption. Even if the ANC was the ultimate explanation for its own corruption, that, too, would count for an argument to #BringBackApartheid. Either way, a trip back to its real roots (systemised white supremacy) would make South Africa more honest with itself.